One of the best parts of the MVP summit is getting together with project managers who bring you all the Microsoft software and seeing exactly how they collect the feedback and how we all end up with the software that we use. 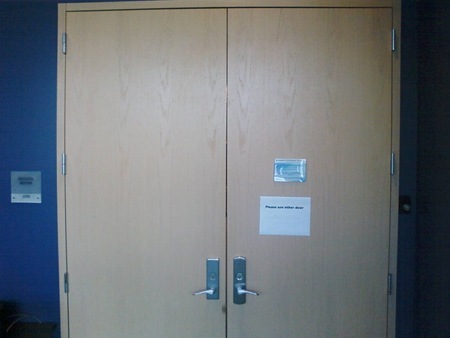 The picture below is of the entrance to the SBS MVP meeting room, where some of the most knowledgeable SBS experts got together with Microsoft SBS team to share feedback, direction, opinions and why wizards are so neccessary because people can’t read the damn documentation. The number of SBS MVPs grabbing or the locked door was just amazing. What was incredible though was that Chris and I were standing outside of the conference room looking and laughing at the whole thing. Two MVPs went up to the door, could not open it, turned around and asked us if we knew if the conference door was locked. 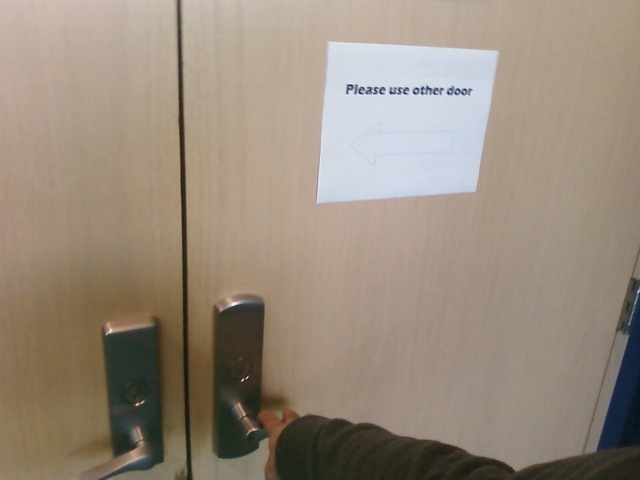 Chris said: “Use the other door” and the guys started to walk the other way in the hallway to try and find the other door.. “No, that door, the one on the left” like the sign says. Reminds me of the Gary Larson comic for the Midvale School for the Gifted, and there’s a kid pushing on a door marked “Pull”. I liked walking through the door even to the left of the door on the left, which was open and lead into the kitchen behind the conference room for the summit. Then I could walk from the kitchen into the summit room, without actually touching any door, both of these were open. Just read this and you made me almost piss my shorts. That was freaking hilarious! I remember watching so many people doing that. Too funny that you took a picture of people doing that. Who was that in the picture? Was that you staging the shot, someone from the product team or someone from the SBS MVP Family?